inscription: Written on the back: "6 yards crepe, 2 yards chiffon" "189.75 56.70 ________ 133.05""Jackson Board"
This costume sketch, designed and executed by William Travilla for Lena Horne, is done on a large cream colored board. The female figure in the center (Lena Horne) is dressed in a slender, brown evening dress with a swag over the left shoulder, brown high heeled shoes and long white gloves. It is signed in brown, just below the figure "Travilla." 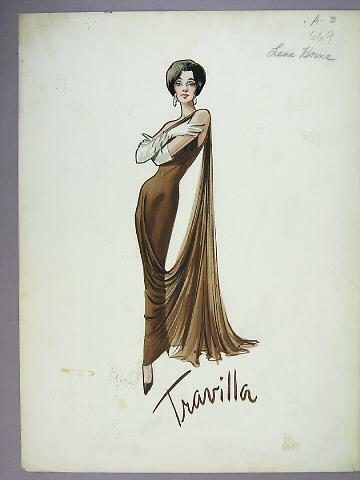 The information written on the back of the drawing indicates that Travilla intended for the gown to be made of crepe (6 yards) and the swag of chiffon (2 yards). William Travilla was one of Hollywood's most prominent costume designers in the mid twentieth century. He was born in Los Angeles on March 22, 1920 and died in Los Angeles on November 2, 1990. In 1949 he received an Academy Award in Costume Design along with Leah Rhodes and Marjorie Best for "The Adventures of Don Juan." In "Fashion in Film" it's reported that Travilla was only included in the preparatory work for "The Adventures of Don Juan." However, when star Errol Flynn refused to wear the mellon breeches and ruff of the period, Travilla altered the costumes. The result was a happy star and not necessarily pure Renaissance style, but credible enough to win an Oscar. He created iconic costumes for Marilyn Monroe in 1953 "Gentlemen Prefer Blondes," 1953 "How to Marry a Millionaire," 1955 "Seven Year Itch" and 1956 "Bus Stop." He designed for Jane Russell in "The Revolt of Mamie Stover," 1956. He went on to design for many films including--1963 "Take Her, She's Mine," 1967 "Valley of the Dolls," etc. He also designed for television and won two Emmys for Costume Design: 1980 "The Scarlett O'Hara War" and 1985 "Dallas." Lena Horne was born in Brooklyn, New York on June 30, 1917. Early films include: 1938 "The Duke is Tops," 1943 "Cabin in the Sky," 1943 "Stormy Weather," 1943 "Swing Fever," 1944 "Broadway Rhythm," 1946 "Ziegfield Follies," 1946 "Till the Clouds Roll By," etc. She also works in television, recordings and stage appearances. It was for a personal appearance that Tarvilla designed this evening gown, probably c. 1980-85. Lena Horne died in 2010.